Henry Whittam doing "watch" Photo sent in by Dennis Whittam , his son. 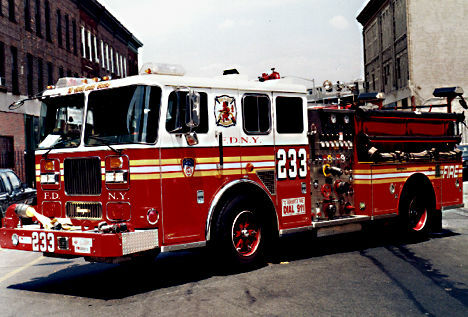 The "Fightin' 33rd" as we call her (referring to her original designation under the Brooklyn F.D. ), was established on October 2nd, 1893 at 243 Hull street. The company would derive it's original slogan from these quarters that she would occupy for 94 years (To Hull & BacK!) She joined the Brooklyn - Queens F.D. on February 23, 1898 and would later become Engine 133. After incorporation into the new F.D.N.Y. we were designated Engine Company 233 on January 1, 1913. 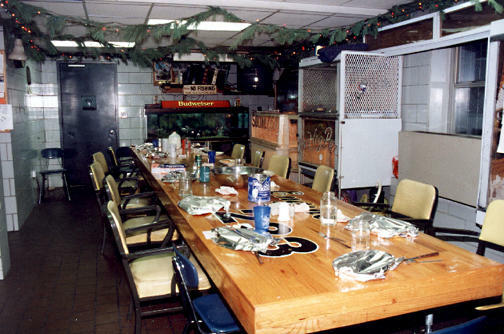 The company permanently relocated to 25 Rockaway, Brooklyn, NY on June 22nd, 1987 and is quartered with Ladder 176, the Field Communications Unit, and the Computer Assisted Dispatch Unit (CADO). Since we were no longer on Hull Street we modified our motto to "To Hell & Back! ".